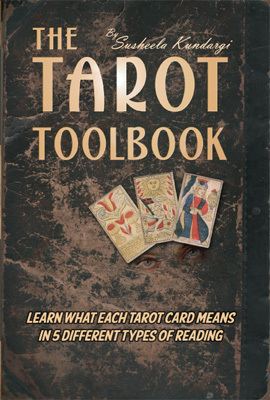 The Tarot Toolbook - The Tarot Toolbook - the best way to learn to read the tarot! of its Kind! - Seriously! The Tarot Toolbook is the only book that teaches you 5 different subject meanings for every card and provides personified character traits for all 78 cards as well. By using this easy method for learning the tarot, you will build better, well-rounded interpretations, which in turn will lead to more accurate & complete readings. Whether this is your very first book on learning to read the Tarot, or you have gone beyond novice or apprentice, you will find the hidden meanings in the cards that you have been searching for. For the cost of 5 minutes on the psychic line, learn how to read the tarot for yourself & your friends! 4.7/5 star rating on Amazon! This is the only book that teaches you 5 different subject meanings for every card and provides personified character traits for all 78 cards as well. By using this method, you will build better, well-rounded interpretations, which in turn will lead to more accurate & complete readings. Whether this is your very first book on learning to read the Tarot, or you have gone beyond novice or apprentice, you will find the hidden meanings in the cards that you have been searching for. For the cost of 5 minutes on the psychic line, learn how to read the tarot for yourself & your friends! 4.7/5 star rating on Amazon!